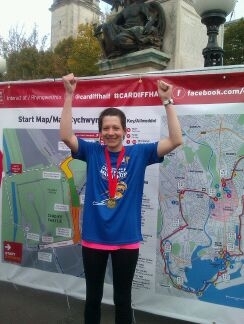 Congratulations to Christine, who successfully completed the Cardiff 1/2 maraton for FaceupCymru !! Christine 32, has been a keen runner for the last 2 – 3 years. She works in Companies House, Cardiff as an administrator. Christine wanted to help raise funds for Faceup Cymru, as her Great uncle died of throat of cancer. John Smith was treated by Mr Fardy and thought very highly of him. Lynne (Christines mum) who works at UHW says as part of his family, we wanted to give something back to show our appreciation of Uncle John’s care. Faceup Cymru wants to say a big congratulations to Christine for all of her hard work, it is much appreciated.